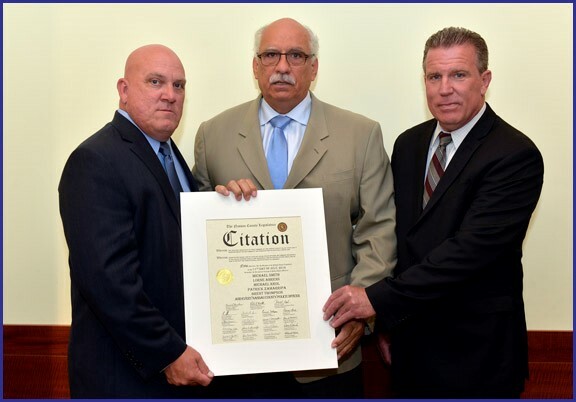 Nassau County Legislator Dennis Dunne, Sr. joined with PBA President James Carver and PBA 1st VP Pete Paterson to honor the five Dallas police officers who were slain on July 7, and to recognize the daily sacrifices made by all police officers nationwide. “Every day, Police Officers in Nassau County and all across our great nation risk their lives to protect citizens and their constitutional rights,” stated Legislator Dunne. Shown in photo above, left to right: PBA President James Carver, Legislator Dunne and PBA 1st Vice President Pete Paterson.